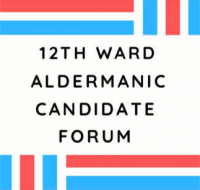 Neighbors for Environmental Justice, alongside the Little Village Environmental Justice Organization and Vota Con Ganas, are sponsoring a 12th Ward Candidate Forum from 6:00 p.m. to 8:00 p.m. on Thursday, February 7, 2019, at the St. Maurice Church hall, 3619 S. Hoyne Ave., Chicago. 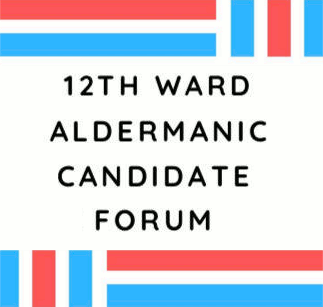 This forum is the only 12th Ward candidate forum before the Feb. 26 citywide elections and will allow residents to hear from the candidates and ask them questions on environmental and other pressing issues that affect our communities. Invited candidates (in alphabetical order) are: Alderman George Cardenas, Pete DeMay, Martha Rangel, and José Rico. Register for the forum now - and - submit a question for the candidates online! Doors open at 5:45 p.m. and dinner will be served. Spanish translation and childcare will also be available. This is a non-partisan event and will not include any candidate endorsements.